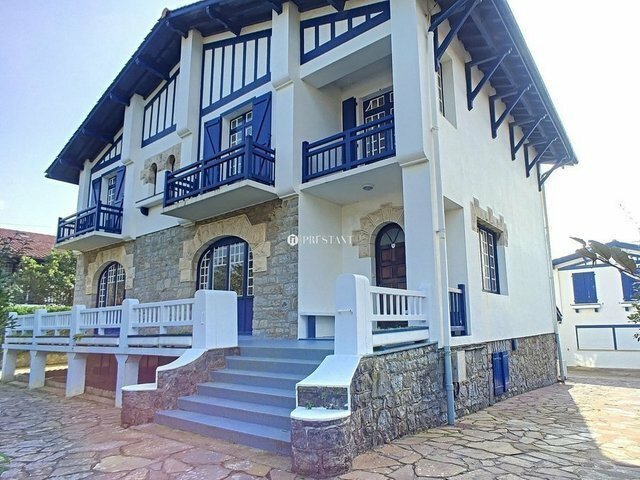 Sale, has Hendaye, ideally located between the beach and the Bay of Txingudi, exceptional traditional Basque of 350 m2 with garden. It's on three levels with a mezzanine, a ground floor and a first floor allowing it to offer eleven rooms including eight bedrooms, three bathrooms, a bathroom and five toilets. Some of the rooms with balconies offer stunning views of the Bay of Txingudi. An outbuilding comprising on two levels, a spacious lounge and a shower room, two bedrooms, a living room with a kitchenette and a separate toilet, all with views and terrrasse on Txingudi bay, complete the house. Work is to predict for this rare property that can suit both a family that has an investor.